Physicists claim they have discovered evidence that the Universe might be a hologram. They have compared the idea with information about the Universe that comes from the cosmic microwave background (the left-over radiation from the Big Bang) and concluded that it may be as plausible as the accepted theory describing the Universe. In ordinary life holograms are images that appear three-dimensional, but are created, through clever tricks, by a two-dimensional surface. When it comes to the Universe, the idea is that all the physics that happens in the world is, in a sense, generated by happenings on a two-dimensional boundary surface. "Imagine that everything you see, feel and hear in three dimensions (and your perception of time) in fact emanates from a flat two-dimensional field," says Kostas Skenderis of the University of Southampton, one of the authors of the new research. 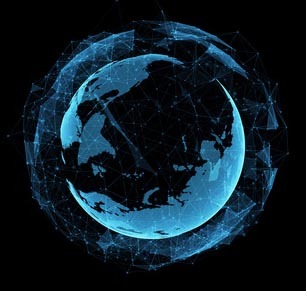 "The idea is similar to that of ordinary holograms where a three-dimensional image is encoded in a two-dimensional surface, such as in the hologram on a credit card. However, this time, the entire Universe is encoded!" The idea becomes a little easier to grasp if you forget about visual holograms and look at the picture below. It's a disc with lots of lines drawn in. To describe the picture, you don't really need to describe each line in its entirety: you only need to say what its end-points are. Thus, the entire disc universe is described by pairs of points on its boundary. 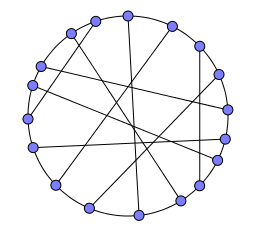 Even if the lines were to move around, the information on the pairs of points is sufficient to describe their motion. In a similar, though hugely more complicated way, physicists have suggested that our Universe has a boundary, and that to describe stuff going on inside it, you only need to describe what's happening on that boundary. Each line is defined by its two end points on the boundary circle of the disc. It's a strange idea, but it didn't come from out of nowhere. Its origins lie with those gravitational monstrosities we call black holes. A black hole is formed when a lot of mass is concentrated in a tiny region of space. If there's enough mass, then its gravitational pull will be so strong that nothing, not even light, can escape from the vicinity of the black hole — hence the name. Black holes come with a boundary of no return called their event horizon: once you pass that boundary you'll be gobbled up by the black hole, never to return. Physicists initially thought of black holes as very simple objects, until a particular problem started to bug them. Were you to fall into a black hole then, naively, it would seem that your fall leaves the world a simpler place: you're a complex being, and all that complexity would have disappeared forever. Such loss of complexity, of information, is not permitted by the laws of physics, however. It violates something called the second law of thermodynamics. (You can test that law out for yourself by not bothering to tidy your bedroom for a while. Left undisturbed it will soon disintegrate into chaos, that is, greater complexity containing more information.) So physicists eventually came around to the idea that black holes aren't just voids, but can be thought of as containing information. But how much information can be contained in a black hole? If you think of information as having a physical manifestation (which it always does), for example in the pages of a book, then the question should amount to asking how much stuff you can fit into the black hole. Obviously, that amount of stuff should be measured by the volume of the black hole. It turns out, however, that the information content (to be precise, the entropy) of a black hole is measured by the surface area of its event horizon (see this Plus article to find out more). This discovery, made in the 1970s, was the first step towards holography: it suggested that the information content of a black hole is something fundamentally two-dimensional. Physicists later went on to suggest that the same goes for ordinary regions of space. Like with our disc universe above, whatever is going on inside them can essentially be encoded in a two-dimensional boundary surface. If this is the case, then our three-dimensional description of physics overshoots the mark, and we should be able to get by with a leaner version. 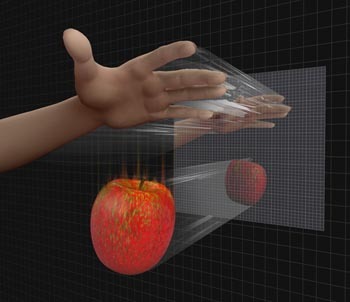 In a holographic universe you can describe the action of dropping an apple in the interior purely in terms of the boundary theory. So far, so similar to our disc universe above. But there's an added, and very important, attraction. The boundary of Maldacena's world is described by a quantum field theory — that's the kind of theory used to describe the smallest building blocks of matter, such as atoms and sub-atomic particles, and their interaction through the electromagnetic force and the strong and weak nuclear forces. Crucially, quantum field theories can't describe the force of gravity. This failing is one of the biggest problems of modern physics and it makes Maldacena's invention all the more amazing: even though it is generated by a gravity-less quantum field theory defined on the boundary, the physics in the interior of his universe does include the force of gravity (for those familiar with the area, it is described by a string theory). Thus, in Maldacena's universe, gravity emerges holographically! So the work may contain a clue as to how quantum physics and the theory describing gravity, Einstein's general relativity, may finally be reconciled. Maldacena's work described a world very different from our own, but since then physicists have come up with theories that could, potentially, apply to the Universe we actually live in. It's these kind of models that were tested in the new research. The team behind it, Niayesh Afshordi, Claudio Corianò, Luigi Delle Rose, Elizabeth Gould and Kostas Skenderis, worked out what holographic models of the very early Universe would imply for the structure of the cosmic microwave background. They then compared these kind of predictions with the real cosmic microwave background and found that a holographic universe could indeed be possible. "Holography is a huge leap forward in the way we think about the structure and creation of the Universe," says Skenderis. "Scientists have been working for decades to combine Einstein's theory of gravity and quantum theory. Some believe the concept of a holographic universe has the potential to reconcile the two. I hope our research takes us another step towards this." "the Universe might be a hologram" - is this any different from saying "the Universe might be mathematically equivalent to a hologram"? Would such a theory make testable predictions that might enable us to determine which is actually the case?